At the end of 1985, PHW was able to make one of its most significant Revolving Fund purchases. The building in question was the Hexagon House, the unique six-sided structure at 530 Amherst Street. Through the early 1980s, the building had transitioned away from residential use to office space. Plans were formulated to build an entirely new medical structure in the front yard, essentially blocking the now iconic view of the “yellow house on the hill.” The plan did not materialize, but it was clear that the Hexagon House was facing dire pressures on its historic integrity. Although the purchase price was far above what PHW could normally afford for a Revolving Fund purchase, the acquisition was possible because a buyer was waiting in the wings – Julian Wood Glass, Jr. In addition, he extended the generous offer for PHW to utilize the building for office space – an offer that has continued today through the Glass-Glen Burnie Foundation and the Museum of the Shenandoah Valley. The Hexagon House was a substantial bump up in floor space from PHW’s first office at 8 East Cork Street. 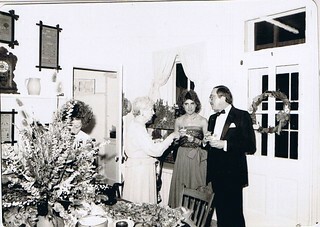 To help furnish the building, PHW hosted a three day gala in April of 1986 much in the spirit of the Holiday House Tours. The house was decorated by a number of antique dealers and interior decorators. Friday evening was an invitation-only cocktail buffet, and Saturday and Sunday were open house tours for the public. The weekend raised just under $5,000.00, and netted several donated furnishings. The refrigerator, donated by Mary Henkel, is still serving PHW to this day! View images from the Cocktail Buffet at Flickr.